Live Learn Shine On: Kylie's Anti Tour Hits UK! So, we are all very happy that April Fools day and Anti Tour on the same day was not a prank ;) and Kylie's already in Manchester getting ready to wow the crowd of Super Fans tonight with her spectacular and breathtaking show! Lovers are updating us with some Anti Tour merchandise in Manchester!! Kylie: "wearing vintage Pam Hogg hat & vintage Sigue Sigue Sputnik top tonight!!! #AntiTour LONDON Big thx 2 Stephen at his shop Rellik"
As for the SET LIST SHOW #1: Acapella versions of What Kind of Fool, (EVERYTHING) I KNOW, Finer Feelings, Tell Tale Signs were heard & IT'S NO SECRET, TOO MUCH. Thats why they write love songs replaced with DO IT AGAIN. Otherwise sounds like it's the same as the Aussie shows, started with MAGNETIC ELECTRIC and Made In Heaven, DISCO DOWN, CHERRY BOMB (with some super special communication with fans at the beginning!!! ), TEARS ON MY PILLOW, OVER DREAMING (OVER YOU)&ALWAYS FIND THE TIME, PAPER DOLLS, STARS, BITTERSWEET GOODBYE, SAY HEY, DRUNK, TEARS ON MY PILLOW & ending with GOT TO BE CERTAIN and ENJOY YOURSELF. And a video put together by Mediamaffia from Say Hey ANTI TOUR MANCHESTER 1ST NIGHT! Thank you!! SHOW #2: ONE BOY GIRL!!! Kylie did One Boy Girl!!! It's just amazing!! LONDON: Kylie sang GIVE ME JUST A LITTLE MORE TIME, IT'S NO SECRET, a snippet of Turn It Into Love, The One and the whole ONE BOY GIRL again! ALWAYS FIND THE TIME with some cool early 90's moves :D YOU'RE THE ONE, CHERRY BOMB, TIGHTROPE, STARS, PAPER DOOLS. DRUNK, TEARS ON MY PILLOW. Miles Lehmann put a 52 minute ANTI TOUR LONDON video together from his footage - enjoy&thank you, Miles! So many impromptu bonus songs/bits of songs! 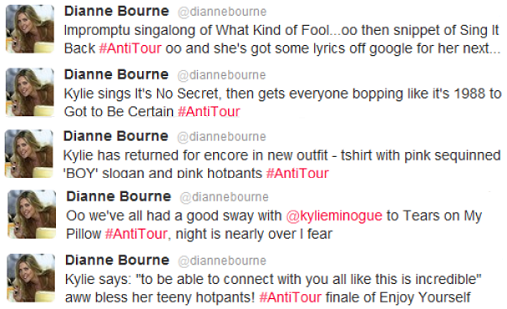 Excellent night at the #AntiTour, thanks @kylieminogue! "At first I wasn't sure if it was him until my friend had the balls to grab his arm and say "are you Kylie's boyfriend?" to which he smiled and said "yes indeed"! My friend then said you must be so proud of her to which he replied "absolutely, just look at her" which I thought was so sweet :-D Made us chuckle when the keyboard player (cannot remember his name) gave her a kiss on the cheek he pointed out and said "Oi you hands off my woman" :-) He is quite a charming and polite (and incredibly gorgeous) man, as she was taking a bow and thanking the audience at the end he thanked us for being there and then ran off stage to meet her! She was absolutely amazing as always and to see here in front, Andres sat next to us and Terry/William and Steve further down on the balcony made the whole night even more special!" I'd like to thank all the Lovers sharing their experience, pictures, videos and emotions to make this blog post possible! Your time and effort is very much appreciated by thousands - just so you know it! :) THANK YOU! That shirt with her leg on the vynil....that is defunutely the first merch t-shirt that I actually like... I need one!! Thanks for the report. If we could only get her back in south america... one can only dream. Нил МакКормик из Телеграфа вроде взрослый человек, но видать собственная гордыня помешала ему вспомнить о главном - он лишний на этом празднике. Черным по белому ведь было сказано "only for super fans", коим он, я уверен, не является. Каким надо быть идиотом, чтобы нести чушь про отсутствие танцоров, хитов и пр. несоответствиях ЕГО ожиданиям и представлениям о поп-коцерте. М-р МакКормик слился вчистую.